The Nova Scotia physics professor who was charged with impaired driving and dangerous driving has struck a plea deal that will keep him out of jail, but off the roads for a while. 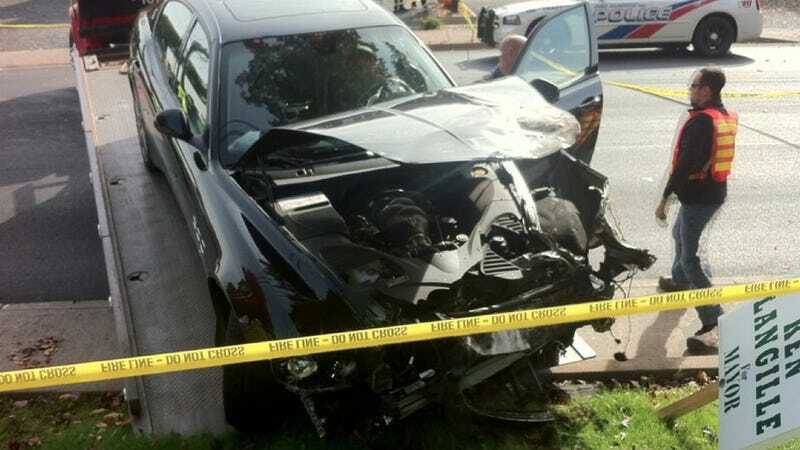 Today Brandon van Zyl, owner of the 2011 Maserati Quattroporte involved in a crash in New Glasgow last fall, pleaded guilty to a lesser charge of driving in a careless and imprudent manner. That carries a 6 month licence suspension and a $1000 fine. The original charges could have put him in prison for up to 5 years. Mr. van Zyl's criminal case is behind him, but a civil lawsuit is on the horizon involving another man who says he was hurt in the collision. Ernie MacInnis was driving a Ford F150 pickup truck which was struck and heavily damaged by van Zyl's oncoming car. The truck ended up on its side, minus the driver's side front wheel, and it was later written off by the insurance company. MacInnis says when the prosecutor told him the criminal charges were being withdrawn, he could not believe the explanation. MacInnis was told that New Glasgow town police and their equipment were to blame for compromised evidence. The police did not test van Zyl's blood alcohol level at the scene using an ALERT device. Instead, they took him directly to the station for what should have been a secondary test on a different device. Regardless of whether he passed or failed the in-station test, the break-in procedure means the related charges have been withdrawn. But what of the dangerous driving allegation? A piece of equipment used to determine a vehicle's speed in the aftermath of a crash was miscalibrated, rendering all of the evidence gathered at the scene useless for prosecution purposes. MacInnis says police told him they believed van Zyl was travelling close to 110 kilometres per hour in a 50 zone, but that information will never be tested in court. MacInnis says it's painfully clear to him — and anyone who has seen the pictures — this was no parking lot fender bender. He's not happy that van Zyl was able to make a plea deal, and he has hired a lawyer to pursue a civil lawsuit. However, he's thankful for two things. One, that his pregnant wife was not in the truck with him at the time. Two, that he was driving his trusty F150, rather than his wife's tiny Toyota Echo hatchback. There was cars everywhere. I had just turned a corner, come up over a hill and around the corner and I see him pull out. He was going so fast that I thought for sure the police were chasing him. When he went sideways and lost control, instead of hitting the brakes and stopping, what you would expect him to do when someone loses control like that, he didn't and punched it and tried to power out of it. And he just kept fishtailing, like cars everywhere, people everywhere. And I was just shocked. And next thing I know, in the blink of an eye, he smashes into me. He went over in my lane, back into his own lane, then back into me. MacInnis was reported by police as an injured party in the crash and he was taken to hospital for an assessment. He claims to have aggravated a previous medical condition. He says he suffers from a rare arthritic ailment that can make even sitting painful. That was the case before the crash. Now he says he requires regular physiotherapy and is still working his way back to pre-crash levels of personal comfort. He also sent some more pictures of his crumpled truck. MacInnis' claims around the crash have not been proven in court. Both Brandon van Zyl and his lawyer declined comment at the courthouse Monday. Mr. van Zyl's last public comments were on the Maserati Life owners forum, where he recently indicated he plans to travel to Montreal or Toronto for a test drive of the newly-launched 2014 Quattroporte.